BRISTOL - One of the highlights of the Bristol Veterans Council meeting Wednesday was the presentation of a check to the group from the Bristol Brass and Wind and Ensemble. 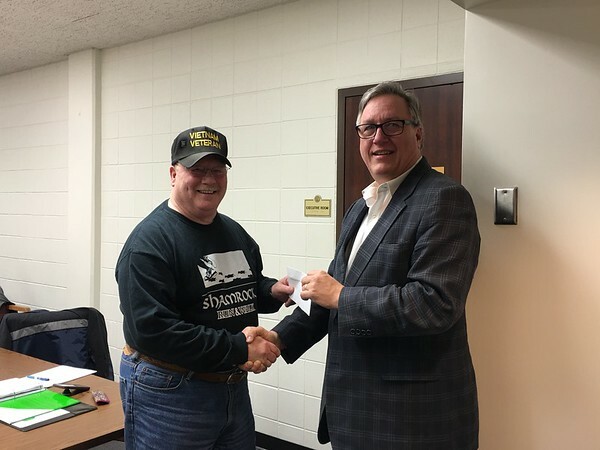 Councilman Greg Hahn, who serves as president of the musical assembly, as well as being one of its trumpet players, presented the check to Tim Gamache, former chairman of the veteran’s group who was overseeing the meeting. The money for the check presented on Wednesday was part of the proceeds from the “A Salute to Veterans” concert that was held at Chippens Hill Middle School on Veterans Day. In other key business, Gamache announced that Bristol’s World War II veterans would occupy the grand marshal vehicles in this year’s Memorial Day procession. It was also noted that the Forestville and Bristol parades would be held on separate days, Sunday, May 26, and Monday, May 27, respectively. Stan Piotrowski, treasurer of the veterans group, noted that the Flag Fund is in the vicinity of $18,000 and that will nearly cover the next three years. An additional $500 is needed and plans were formulated to acquire that money in the near future. Each year, veterans and their organizations gather to replace the broken and tattered American Flags that sit at the gravesites of those from Bristol who served this country in the military. Posted in The Bristol Press, Bristol on Thursday, 7 February 2019 19:58. Updated: Thursday, 7 February 2019 20:01.